Sheldon Lee Glashow (/ˈɡlæʃoʊ/; born December 5, 1932) is a Nobel Prize winning American theoretical physicist. He is the Metcalf Professor of Mathematics and Physics at Boston University and Eugene Higgins Professor of Physics, Emeritus, at Harvard University, and is a member of the Board of Sponsors for the Bulletin of the Atomic Scientists. Sheldon Lee Glashow was born in New York City, to Jewish immigrants from Russia, Bella (née Rubin) and Lewis Gluchovsky, a plumber. He graduated from Bronx High School of Science in 1950. Glashow was in the same graduating class as Steven Weinberg, whose own research, independent of Glashow's, would result in Glashow, Weinberg, and Abdus Salam sharing the 1979 Nobel Prize in Physics (see below). Glashow received a Bachelor of Arts degree from Cornell University in 1954 and a Ph.D. degree in physics from Harvard University in 1959 under Nobel-laureate physicist Julian Schwinger. 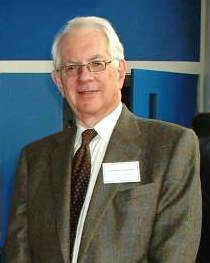 Afterwards, Glashow became a NSF fellow at NORDITA and joined the University of California, Berkeley where he was an associate professor from 1962 to 1966. He joined the Harvard physics department as a professor in 1966, and was named Eugene Higgins Professor of Physics in 1979; he became emeritus in 2000. Glashow has been a visiting scientist at CERN, and professor at Aix-Marseille University, MIT, Brookhaven Laboratory, Texas A&M, the University of Houston, and Boston University. In 1961, Glashow extended electroweak unification models due to Schwinger by including a short range neutral current, the Z0. The resulting symmetry structure that Glashow proposed, SU(2) × U(1), forms the basis of the accepted theory of the electroweak interactions. For this discovery, Glashow along with Steven Weinberg and Abdus Salam, was awarded the 1979 Nobel Prize in Physics. In collaboration with James Bjorken, Glashow was the first to predict a fourth quark, the charm quark, in 1964. This was at a time when 4 leptons had been discovered but only 3 quarks proposed. The development of their work in 1970, the GIM mechanism showed that the two quark pairs: (d.s), (u,c), would largely cancel out flavor changing neutral currents, which had been observed experimentally at far lower levels than theoretically predicted on the basis of 3 quarks only. The prediction of the charm quark also removed a technical disaster for any quantum field theory with unequal numbers of quarks and leptons — an anomaly — where classical field theory symmetries fail to carry over into the quantum theory. In 1973, Glashow and Howard Georgi proposed the first grand unified theory. They discovered how to fit the gauge forces in the standard model into an SU(5) group, and the quarks and leptons into two simple representations. Their theory qualitatively predicted the general pattern of coupling constant running, with plausible assumptions, it gave rough mass ratio values between third generation leptons and quarks, and it was the first indication that the law of Baryon number is inexact, that the proton is unstable. This work was the foundation for all future unifying work. Glashow shared the 1977 J. Robert Oppenheimer Memorial Prize with Feza Gürsey. Glashow is a skeptic of superstring theory due to its lack of experimentally testable predictions. He had campaigned to keep string theorists out of the Harvard physics department, though the campaign failed. About ten minutes into "String's the Thing", the second episode of The Elegant Universe TV series, he describes superstring theory as a discipline distinct from physics, saying "...you may call it a tumor, if you will...". Glashow is married to the former Joan Shirley Alexander. They have four children. Lynn Margulis was Joan's sister, making Carl Sagan his former brother-in-law. Daniel Kleitman, who was another doctoral student of Julian Schwinger, is also his brother-in-law, through Joan's other sister, Sharon. In 2003 he was one of 22 Nobel Laureates who signed the Humanist Manifesto. Glashow has described himself as a "practising atheist" and he is a Democrat. ^ Sheldon Lee Glashow – Britannica Encyclopedia. Britannica.com. Retrieved on 2012-07-27. ^ a b c Glashow's autobiography. Nobelprize.org. Retrieved on 2012-07-27. ^ Sheldon Glashow. Jewishvirtuallibrary.org. Retrieved on 2012-07-27. ^ "Gürsey and Glashow share Oppenheimer memorial". Physics Today. American Institute of Physics. May 1977. doi:10.1063/1.3037556. Retrieved 1 March 2015. ^ Jim Holt (2006-10-02), "Unstrung", The New Yorker. Retrieved on 2012-07-27. ^ "Notable Signers". Humanism and Its Aspirations. American Humanist Association. Retrieved October 2, 2012. ^ Sheldon Glashow, Nobel Prize in Physics for the Electroweak Theory . La Vanguardia, 20 June 2017, raed.academy/wp-content/uploads/2017/06/Sheldon-Lee-Glashow-contraLVeng.pdf. This page is based on the Wikipedia article Sheldon Lee Glashow; it is used under the Creative Commons Attribution-ShareAlike 3.0 Unported License (CC-BY-SA). You may redistribute it, verbatim or modified, providing that you comply with the terms of the CC-BY-SA.